Do you have indelible food memories, a library of tastes that when encountered, instantly transport you through space and time? I have many. Jam tarts were a commercial cake shop staple during my childhood. Usually the pastry was thick and gluey, the jam so heavily sweetened that the flavour of the fruit was indiscernible. I found it easy to refuse those jam tarts. It was only to be a polite that I accepted a modest piece of plum jam tart in an Italian home during my first visit overseas, 22 years ago. It was a revelation. The biscuit crust was buttery and crisp, it melted in my mouth and the filling of plum jam was tart and fruity, distinctively plum. The memory of that tart has stayed with me but I had never tried to replicate the delicious flavour for fear of spoiling that long held memory, then, a few weeks ago I made plum jam, tart plum jam. The flavour sent me instantly to Italy 1997, and to search for a reliable recipe for a simple Italian pasta frolla, sweet shortcrust pastry. There’s no one better than Marcella Hazan’s to turn to for authentic Italian food, so, guided by her recipe for La Crostata di Mamma in The Second Book of Classic Italian Food, I recreated my ultimate Italian jam tart. The pastry was sublime. My long held memory of that Italian jam tart is thankfully still intact. The simple plum jam tart I made was incredibly delicious, especially with a dollop of whipped cream. This pastry recipe will be my sweet shortcrust of choice in the future. In a medium sized bowl, mix together the flour, sugar and salt. Make a well in the centre of the dry ingredients then add the lemon zest, butter, egg yolks and milk. Mix everything together until the dough form, then knead lightly until smooth and the ingredients are evenly distributed. Put the dough into a covered container and chill for 30 minutes. Take 2/3 of the dough, place it on a sheet of baking paper. Place a second piece of baking paper over the dough then roll into a neat circle about 1 cm thick. Lift the pastry, on the paper onto a baking tray. Stir the jam to loosen the texture then spread it over the dough leaving a 1cm margin at the edge. Roll the small piece of dough 1 cm thick then cut into strips about 1 cm wide. Make a lattice with the pastry strips over the jam. Take the remaining scraps and roll into a sausage about 1 cm thick. Lay the pastry roll around the edge of the tart, push down gently to seal. Bake the tart for 15-20 minutes until golden brown. I am on a plum baking binge at the moment and would love to make your plum jam. Would you be able to post a recipe of your jam so that I can make some …to freeze (which never occurred to me to do and is a brilliant idea) and to make this tart? Also what plums do your recommend? Thank you for your very speedy reply. It is much appreciated. I have never made jam before but more than willing to give it a try. Just wondering about the Queen Garnet plum. I know the scientist who engineered to plum so it is close to my heart. Would that variety suit plum jam? Thank you. You are a gem…..must be because you live in Brisbane, where I live! 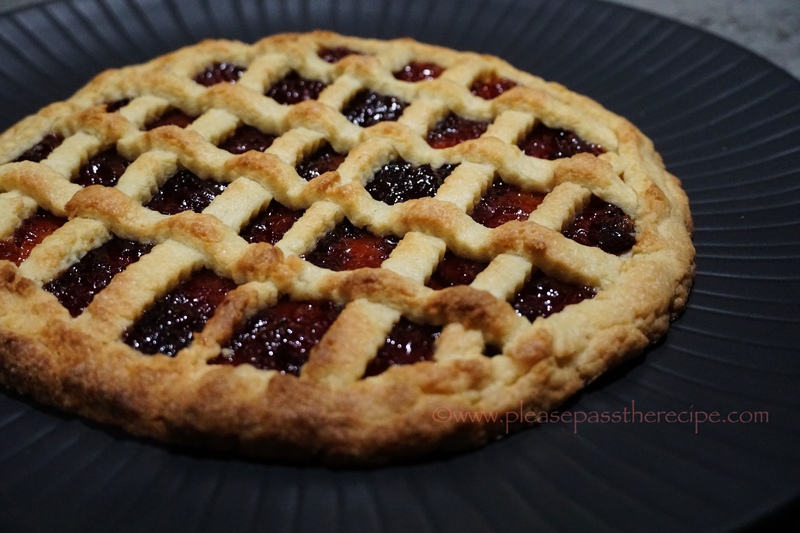 Gosh I have such a strong memory of my first crostata too, and how the pastry was like a shortcrust but different, tho I wasn’t quite sure what it was at the time… I have so much jam stashed too – two full shelves – so I’ll definitely be making this! Sandra, food memories… ah yes. (So many here, too!) Thank you for sharing your “go to” sweet shortcrust recipe from now on, as well as this jam tart. Both sound wonderful! Thanks Kim and you’re welcome. Delicious. I have also tasted the best crostata di frutta in Italy. It is one dessert they excel at. ( I have to say, there aren’t that many). I glad you have used Hazan;s recipe here- I am always in search of a good Pasta Frolla recipe and trust your opinion and testing of this. I have far too much jam stashed. We grew up with a set of tarts as you describe. Claggy pastry filled with over-sweet fruit goo. Yours is as far as possible from that. Bravo. Ooh…I love jam crostatas. I try (but don’t always achieve) to have a stash of sweet crostata dough in the freezer for just such a recipe – can be assembled as soon as defrosting happens when unexpected guests turn up for dinner! Oh and there is always homemade jam in the larder. Favourites for crostatas are apricot or plum. You are right – start with the best ingredients; no nasty jam. We were so impressed with Hazan’s pasta frolla that I made a decision to keep tart sized portions in the freezer. Like you there is always homemade jam in the freezer, although I regret not making more apricot jam this summer, it was a particularly good season. I really think we are simpatico…. A dab of JeReviens perfume is my time machine. I do remember the commercial fruit tarts. Look forward to trying the real thing. Perfumes are incredibly evocative do you feel young again when you wear it? A light jam tart is an art and I believe it’s an art you have mastered. I have vivid food memories and love it when one occurs. Funny how food ties one to the past. If I hit my thumb with a hammer, I don’t go oh I remember doing that in July of 1997. But, I can taste a dish or spoon of food and zoom I’m right back there. Isn’t food memory amazing Ron, this simple jam tart sent me way back. Looks delicious! And it reminds me of a tart that my aunt use to make me when I was a child! The taste was more subtle than you expect from what you see. The pastry was amongst the best I can recall and the jam was the perfect partner to the pastry. Thanks, Sandra. I WILL be making this very soon, it looks delicious. This entry was posted on March 21, 2019 by ladyredspecs in Baking, Breakfast and Brunch, Cakes, Cooking, Desserts, Food, Fruit Desserts, recipes, Slices and Tray Bakes and tagged crostata, dessert, Italian fruit tart, Marcella Hazan, plum, plum jam, sweet tart.